We couldn't think of a more fitting location to deliver a $3 million supercar. Pebble Beach is full of affluence, automotive enthusiasts and extremely rare pieces of automotive history. It is the perfect setting for the delivery of the first Bugatti Chiron in the U.S. This past weekend a bright yellow and black Bugatti Chiron was delivered to one lucky owner to the tune of $2.998 million. This rolling piece of art is powered by a quad-turbocharged 8.0-liter W-16 engine making 1,479 horsepower and 1,180 lb-ft of torque. The power is diverted to all four wheels via a seven-speed dual clutch transmission. The deadly combo allows the Chiron to hit 60 mph in just 2.4 seconds and it can achieve a top speed of 261 mph. Unfortunately, that translates to 9 mpg city and 14 mpg highway. However, if you own a three million dollar car, we doubt you care about fuel costs. 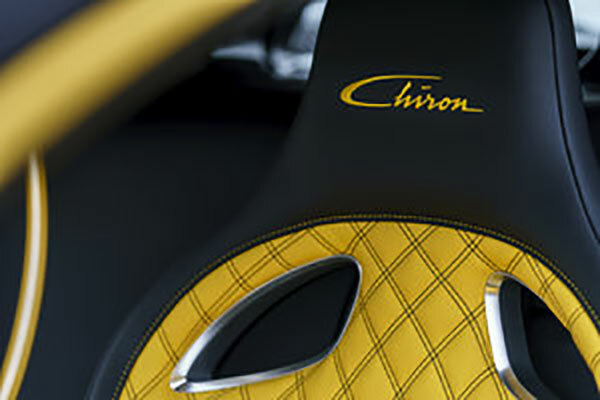 The front of the Bugatti Chiron sports a vibrant yellow paint scheme that travels along the side of the Chiron until it is met with a contrasting "classique" black. The two-tone paint scheme is unique to the Chiron line up and since only 500 Chirons will be made in total, we don't you will see more than one of these schemes in your life. Unwrapping the First Customer Bugatti Chiron in the U.S. It's like opening Christmas presents, but better. Turns out, all that power and record-beating top speeds call for quite a bit of time at the pumps. Does that mean we will get more than 1,479 horsepower? What is Bugatti up to with this blacked-out mule? Listen to this Chiron make tons of turbo noises while attacking a hill climb race.